Well, it seems the folks at Arnott’s have been busy cooking up more treats with fitness-dancer-turned-patissier Adriano Zumbo. The latest offering to hit the shelves is the Tim Tam Red Velvet, designed to taste like a red velvet cupcake. Red Velvet cakes are so called because they are red. Apparently this all goes back to the second world war, when bakers would use beetroot to colour their chocolate cakes, given that actual chocolate was in such short supply. Nowadays, of course, we can simply use food colouring, although it is to Arnott’s credit that they use natural colour extracted from South American parasitic insects, rather than nasty artificial colour extracted from fossilised trees. They look just like regular Tim Tams, although once again we only have nine in a pack. This cheapskatery does rankle with me a little, to be honest. There’s nothing worse than eating y0ur ninth Tim Tam, then reaching out in anticipation of your penultimate biscuit only to find the packet is inexplicably empty. Oh well. I suppose Arnott’s have to pay Zumbo’s licensing fees somehow. 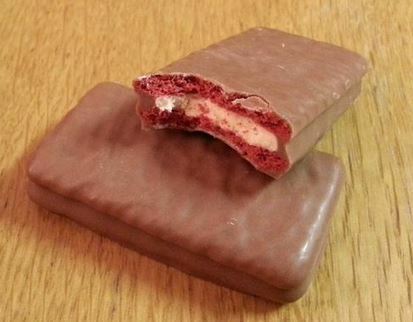 When you bite into a Red Velvet Tim Tam, the red colour is quite striking. The biscuit is chocolatey, and the filling tastes remarkably similar to cream cheese icing. Indeed, I would say these really do live up to the billing; they taste pretty much exactly like a red velvet cup cake – moreish, rich, and slightly sickly. They are actually pretty good; I’d go as far as to say they are the best of the Zumbo Tim Tams. I’m going to give these and eight and a half out of ten.